From the June/July 2017 issue. In March 2017, Jeffery Hutchinson was appointed as the Commissioner of the Canadian Coast Guard, serving previously in the position of Deputy Commissioner, Strategy and Shipbuilding from 2015 to 2017. Prior to this, Commissioner Hutchinson held the positions of Director General, National Strategies, and Director General, Integrated Business Management Services. 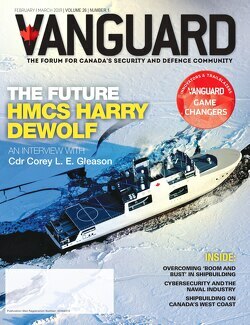 Managing Editor of Vanguard, Marcello Sukhdeo had the opportunity to speak with Commissioner Hutchinson on his new role, his focus and vision for the Canadian Coast Guard, and his pressing needs on procurement. Q: Firstly, knowing that you’ve been in your new role for just only a few months, what’s your assessment of your new position? This is a great job. This is a job where I get up, and I can’t wait to get to work every morning. I was promoted from within the Coast Guard, so it’s not as if the organization itself came as a big surprise to me or anything like that. We’ve been working for some time at building a very high-quality management team in the Coast Guard. I think we have a terrific team around the table. We have a lot on our plates in terms of government priorities and advancing the mission of the organization. Although we’ve got some big challenges like the Phoenix pay system, this is a job that it’s exciting. We’ve got people that are interested in being partners with us. We’re interested in growing those relationships, and we believe there’s never been a more exciting time to be in the Coast Guard. There’s never been a more exciting time to be at the helm. 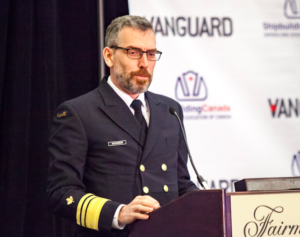 Q: What is the focus and vision for the Canadian Coast Guard under your leadership, and how is that different from your predecessor? My focus as Commissioner is very much going to be on the people. We refer to people that work here as Coast Guard members. I think of the Coast Guard as a family. We call each other Coasties. We can’t deliver our mandate without a highly trained, engaged, professional, at-the-ready workforce. We’ve had a couple years, as many federal departments have, of financial restraint. We’ve had the challenges of the pay system. We’ve got demographic challenges as we have an ageing workforce. Commissioner Hutchinson during his keynote address at Vanguard’s Shipbuilding Technology Forum 2017. We are very much on the page of building on the experience that we have, drawing on the depth that we have in our senior leaders now. I’m talking about captains who are the best Arctic ship captains in the world. I’m talking about search and rescue specialists who really know what they’re about. I’m talking about environmental response people who know how to do this. They haven’t just read it in a book. We’re talking about taking that experience and transferring it to young people as they come in, as we look to build as diverse a workforce as we need to be reflective of the Canadian population. If we don’t focus on our people, we’ll never succeed as an organization. You asked, “How is that different from Commissioner Thomas?” When Commissioner Thomas was here, you may have seen public statements by her that she was focused on five M’s: membership, mission, mandate, money, and marketing. Among those five M’s, her focus was money, and that was because the Coast Guard was struggling financially. I don’t think there are any two ways about it. The announcement of the Oceans Protection Plan last November means that the Coast Guard does have new financial resources available to it. Although we need to be prudent with that money, we need to be focused on the outcomes of the Oceans Protection Plan. I would say that I’ve really taken her five-M’s framework and I’ve just picked up on the next thing which should always be our highest priority, which is members. I think what I’m doing is consistent with Commissioner Thomas’ vision and I think there’s zero chance that she would disagree that this organization relies on people as much as any organization that you’ll find. Q: Talking about the workforce, there’s been some news about the hiring blitz within the Canadian Coast Guard. Can you share some more information on that, and what’s the latest update? What ranks are you looking to beef up? Over the next two years, we are increasing our workforce by 15 per cent. This will help improve our search and rescue capacity, strengthen our ability to respond to marine environmental emergencies, and improve the way we work with Indigenous groups and industry. We need people in many different parts of the Coast Guard. We want to build the teams that focus on environmental response expertise. That includes people who are going to be the leading thinkers, almost academics, if you will. People that are following what’s happening in the innovation field. We’ll be hiring on that side, but we’ll also be hiring people that are going to be the boots on the ground. People who know how to deploy equipment in the middle of the night in crappy weather conditions to make sure we keep oil off the shoreline and oil out of sensitive habitat and ecosystems. It’s going to be frontline forces. It’s going to be our policy people. We’ll be looking to hire more mariners for sure, and we always have a need for engineers and technicians, which I think a lot of people don’t appreciate about the Coast Guard. We have about 1,000 people now who work on communications towers and radar systems and very sophisticated, high-end GPS which is an order of magnitude more sophisticated than you might have in a car today. Some of these folks are at drafting tables drawing solutions to problems, and others are out on snow mobiles and 4x4s and climbing towers and fixing satellite dishes and that kind of thing. That technical engineering side is also an area where we’ll be focusing. Q: You’ve touched on some of the challenges already. What would you say are the other top challenges facing the Canadian Coast Guard today? We have areas that we need to reinvest in, like training of our frontline forces. We have very capable people, but I would love to support them with more hands-on training. Think of training in the sense of learning equipment, learning techniques, learning about how different products respond in the water and about environmental response. Q: Innovation is a big component in organizations today, are there any new programs that you are looking to initiate within the Coast Guard as it relates to innovation in technology? We used to have a program that promoted research and development within the Coast Guard. We are putting that program back on its feet. We have a lot of technical expertise in this organization, and those folks have been very focused on ship maintenance, vessel life extension, tower maintenance, emergencies repairs as some of our assets have aged. With the focus on the Oceans Protection Plan, one of our mandates within that plan is to be at the leading edge of environmental response technology. We think that that means internally having a program – internally understanding what’s happening out there in other countries in the industry. Given our level of hands-on experience, I think that we need to be part of the conversation of where the whole conversation goes next. People talk about alternate response measures, chemical agents that disperse oil and things like that, I think we need to push beyond that thinking to the next level. I think we’ve got to talk about the role of automated equipment, both ships and airborne drones for search and rescue, for environmental response, for coastal protection, for prevention. One of the things that both the Brits and the Canadians are doing right now is monitoring the behaviour of ships as they approach, in the British case, obviously, the English Channel or as they approach the Canadian shoreline. We watch the behaviour of ships to look for anomalies – things that might tell us in advance that we’re going to have a problem. I want to get our folks thinking that innovation is what we do for a living, to make sure that we are as ready as we can be as far in advance as we can be so our response is ready to go. We also must be looking at technology for service delivery. Q: Last year there were some reports about the fleet depletion in the Coast Guard with the average age of vessels being around 34 years. What is being done to address this? The first thing I want to address is that number 34 years. We’ve actually got quite a large fleet. It’s 115 vessels. When you see a number like 34, that’s actually referring to a subset of our overall fleet. When we talk about a number that’s in the 30- to 35-year range, we’re generally talking about the ice breaking fleet. The idea that gets into the media sometimes that any part of the fleet, including the ice breaker fleet, is about to disappear from service is just absolutely wrong. Most ships are very well-built. They’re very heavy in their construction. They were built for a robust job, and they will continue to serve for some time to come. That said, we do have a plan to see that part of the fleet renewed. You know that has to happen eventually. You can’t keep a ship running forever. As we look out over the next, let’s say, 10 to 15 years, we know that the ice breakers will have to be replaced. We want to take some of the other old ships, even the ones that aren’t ice breakers, we want to get them replaced. As we do that, a couple of things are going to happen. One is the current fleet will have to go into a rotational cycle to keep ships, pardon the expression, in ship-shape. We call it vessel life extension. You take a ship out for several months. You put major work into that ship, and you can extend its life for a period that, in round numbers, we might say 10 years. We’ll have ships going through vessel life extension, and that’s going to mean our total available number of ice breakers for specific years will be lower than we want it to be. We have a plan, that we’re currently part way through, to bring in some temporary capacity, interim capacity it’s usually referred to, where we will likely lease some ships or possibly buy some ships that will fill in gaps until we can get into the cycle of building the ice breakers that we need going forward. We don’t want to buy a bunch of one-off ships. We don’t want a patchwork of 15 different ice breakers. We want classes of ships. This is modern fleet management where you have a good size class of ships all built to the same specs, all with the same engines, all with the same equipment, so your maintenance costs are lower, your engineering costs are lower, your spare parts costs are lower. That’s the direction we’re going in, but we realize that may need some interim capacity along the way. In the end, we try to have a fleet that is affordable for Canadians and effective for Canadians. Q: What are your most pressing needs now with regards to procurement? We know you talked about the ice breakers. Do you have any other pressing needs? Well, we have ships under construction at Vancouver Shipyard. We really are anxious to see the whole shipbuilding project get to the point of just a regular case, where ships are coming out of the yard with a nice steady clip that allows us to manage the maintenance needs that I talked about; that allows us to execute a medium and longer-term plan. I would say that on the shipbuilding side, is where our thinking is at. Under the Oceans Protection Plan, there are several investments that are key as well. We want to get right on them. There’s replacement of old equipment. We want our people to respond with the best available oil-response equipment. That’s going to be a big piece this year. We’ve got radar sights to deliver under Oceans Protection Plan. That’s a very high priority for us obviously because it gives eyes and ears along the coast that really contribute to the prevention of incidents. Then the other piece that’s moving along very, very nicely is the lifeboat piece. Minister LeBlanc was just speaking about that recently in public. We’re optimistic and anxious to get those ships into service. We are getting ready to bring the polar class ice breaker into service in the early 2020’s, and we’ll be putting a couple of heavier duty helicopters into service – Polar ready helicopters. Then we have a project underway to build a helicopter simulator at the Ottawa Airport. That project is coming along nicely. When it’s done, we’re going to have a really terrific training facility that will be used by ourselves and Transport Canada. We’ll be able to make simulator time available to other partners as well. Our helicopter fleet, our helicopter situation, is in very good shape, and it’s going to be in very good shape for the near future. Q: With the last federal budget, how’s that going to impact what you’re looking to get done for the Coast Guard? The Coast Guard at its heart and soul is a response organization. We always, always, always prioritize the safety of life at sea. Search and rescue will always be the thing that we drop everything to get done, but in second place, and it’s a close second, we are an environmental organization at our core. People that join the Coast Guard love our coastline. They love our oceans. They particularly love our Arctic, and they love the fact that the word “guard” in our name refers as much to the Canadian environment as it does to anything else. The Oceans Protection Plan investments into the Coast Guard are very much focused on protecting that environment for Canadians. It gives us a long list of to-do items, but they’re exciting. They include things like strengthening our partnerships with coastal and aboriginal communities, Indigenous communities, because the people who live near the water are passionate about it, knowledgeable about it, and they’re always ready to protect it. The Oceans Protection Plan gives us some flexibility to build those partnerships. It gives us funding to make sure that we’ve got the best equipment that we can get our hands on right now. It gives us money to increase our capability to tow vessels that get into trouble, by deploying very modern emergency tow kits onto our big ships, but also by bringing some tow capacity into the fleet that we don’t currently have by releasing some big, robust emergency tow-capable vessels. We’re in the process of doing that. It gives us money to create what you might think of as being SWAT teams for the environment. We call them Primary Environmental Response. These teams are going to be highly trained, quickly deployed. They’ll get into any situation, and they’ll get it under control, assert the commanding control of the Coast Guard, and the ability to bring people together very quickly to respond. There’s money there for radar coverage that will increase our eyes and ears on the water, which goes right to prevention. That’s east coast and west coast. It gives us training dollars so we can get people trained up to the leading-edge standards. It gives us more reach into the North, both on the search and rescue side and on the environmental response side. The budget gives us a lot of responsibility. There are no two ways about that, but it just feels like a shot of adrenaline into the very thing that Coasties come to work to do every day. It just brings me back to my very first comment. There’s never been a more exciting time to be here because we’re being asked to make sure we’re ready and able to do those things that we’re most passionate about. Q: In closing, is there anything else you would like to share with our readers? People who want to contribute to the country on the environmental front – we’re a place you can do that right at the front line. We’re definitely open for business in a sense of looking out for young people who are passionate about the environment, who want to do something, who want to contribute. They don’t just want to talk about; they want to get out there and get their hands on something practical. Those are the folks we’re looking for as we look to fill the positions that are now available to us under the Oceans Protection Plan. Thanks for taking the time Commissioner to speak with Vanguard. We appreciate hearing about your vision and insight about where the Canadian Coast Guard is headed. We appreciate it too. I personally appreciate the chance to speak with Vanguard. I have to say I’m very grateful for the invitation to speak at the last shipbuilding event in March. I thought that was a great room full of people. Had some great questions, and I heard from lots of people after my presentation as well, so I know people are really engaged in moving the whole industry forward. We want to be part of that.